Ask fellow campers about "Triple Falls RV Park" and nearby attractions. This campground is pretty much the only game in town, but that was OK with us. We had a fairly level back-in site, gravel & dirt. The power was a bit on the weak side, and while Wi-Fi is advertised, I was never able to connect. However, compared to a number of Newfoundland Campgrounds, this is nice! Close to town and close to other attractions. Caution! Moose and Caribou can often been in camp with you. Clean showers / restrooms, plenty of hot water. We camped at Triple Falls RV Park in a Travel Trailer. Take a whale watching boat tour, visit the Grenfell Museum & House, and the Viking Villages. As mentioned in a previous review, the place is...ok. The best spots are for the seasonals. What you get is an open area that if you had a slide you would be opening it into your neighbour. No picnic table. No room. As for the wifi, someone has set it up wrong. It's not from too many people on it. We spent the previous night down the road nearer L'ance aux Meadows at Quirpon. We camped at Triple Falls RV Park in a Fifth Wheel. Not many options while in St. Anthony, but be prepared. Entrance is hard to maneuver and potholes everywhere. Owners are not friendly and act as if they are doing you a favor letting you stay. They promise Wi-Fi, but it is nonexistent. You may connect at the office at odd hours but still get kicked off every minute or so. 30 amp only and no sewer. Water is good or needs boiled according to which employee you ask. Sites are not close to level so maneuver as best you can. Small store onsite. We camped at Triple Falls RV Park in a Motorhome. Viking Feast held at Lighthouse two or three times per week and well worth the cost. Of course, do not miss L'Anse aux Meadows where the vikings landed 1000 years ago. 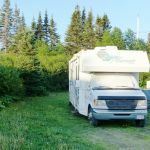 We used this park for two nights as our base for exploring St. Anthony and L'Anse aux Meadows. We were parked in the front section near the entrance, but weren't bothered by any road noise. The sites are all back-in, gravel or grass, and some more level than others. If all the sites were full along this front side, it would be very tight for slides and awnings. It appeared to us that most of the sites in the back section are for seasonal stays. Wifi was slow at times, but would be a lot worse if more people in the park. Be sure you know the best route to get to the dump station; the front roadway was a narrow path and full of potholes. We didn't use the restrooms or laundry room. We camped at Triple Falls RV Park in a Motorhome. The Northern Delight restaurant north of Gunner's Cove was very good. We enjoyed a nice lunch and took one of their freshly cooked (and cleaned) snow crabs home for dinner ($12 CAN). This park is a bad value compared with others in Newfoundland. The roads are mud and gravel with large potholes everywhere. There are no sewer hookups, just a dump station at the end of a muddy, bumpy road. The road out of the dump station is so narrow that brush (badly in need of trimming) rubs the sides of your rig. Wifi is available only very close to the office, and worked less than half the days we were there. The quality of the sites is highly variable. Most of the large, widely spaced, quiet wooded sites are occupied by long term tenants. Transients seem to be assigned tiny sites close to the highway. Many of these sites are nowhere near level. We camped at Triple Falls RV Park in a Fifth Wheel. Skip St. Anthony. There are more accessible places to see icebergs and whales. Once you go into the wilderness beyond Gros Morne National Park the none-to-good Newfoundland roads have sections which are absolutely atrocious. If you must go, plan on driving 20 mph for long stretches and consuming a day to go from Gros Morne to St. Anthony. 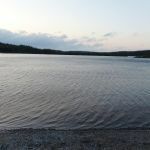 In contrast, for the same nightly rate we stayed in Rocky Harbour, NL, and had a sewer connection, strong dependable Wifi, and smooth interior roads. This campground caters primarily to seasonal RVers, where the sites are spacious and private. The section for overnighters is simply an open field with 2 rows of RVs lined up facing each other, on very unlevel sites. There is no cell phone coverage by any carrier so it is necessary to drive closer to St Anthony, specifically at least to the Municipal dump 6 km away, to get a signal. There is a pay phone outside the office. Wi-Fi is ridiculous - we have 4 devices (2 laptops, a tablet, and a phone) and only one device could connect and then at only 1 bar when in the same room as the router. I am so fed up with campgrounds that advertise having Wi-Fi when the service they provide is not adequate to even check emails. During our stay, the electricity cut out frequently. No TV stations are available via antenna, but satellite reception works. On weekends they have a chip truck that sells fried fast foods. Their convenience store only stocks bottled water and beer. Washrooms are clean with free hot water and there is a laundry (wash & dry = $2 each). No recycling is available. If you are in this area to visit L'Anse au Meadows and see the icebergs as we were, your camping options are limited. I did not view the private RV park in Quipon, which is closer to L'Anse au Meadows, so cannot comment. Pistolet Bay Provincial Park has only unserviced sites. The town of St Anthony, 10 km from the campground, has 2 grocery stores, gas & diesel, several restaurants, and a couple of hardware stores. We camped at Triple Falls RV Park in a Fifth Wheel. We were here once before almost 10 years ago. I can't say there has been much change as far as the overnight spots are concerned. Many of the sites are occupied by seasonals. For the transients there are about 12 gravel or grass sites near the front and a larger area (about 25 gravel sites) in the back used by caravans. We got to choose our site from those that weren't already occupied. I chose one near the front as it was closer to the laundry. None of the front sites looked level. Ours certainly wasn't. Electric and water hookups worked fine. The dump station is off in the back of the park. It was in good working order. Laundry had 4 washers and 4 dryers. One of the washers was out of order. Washers worked fine, but dryers could have been a bit hotter. It cost $2 (loonies only) for wash or dry. No cable TV or any channels off the antenna. Didn't bother trying for satellite, but it would be possible in some of the sites. Wi-Fi slow at times and got dropped more than a few times. Still this is a good location between St. Anthony and L'Anse aux Meadows and would stay here again if ever back. We camped at Triple Falls RV Park in a Motorhome. The owners were friendly and helpful. It is a great spot to use as a base to tour Lanse Aux Meadows and the St. Anthony area. The site we were assigned near the entrance was not very level, but the owner made some lumber available to help us to finish leveling. The Wi-Fi has very limited range, but we were able to use it at our site. Lots of seasonal campers in the main area and most of the transients seemed to be near the entrance where we were. No sewer connections available so we used the sani-station when we left - it was easily accessible. Not luxury, but comfortable with free showers and a good laundry. We camped at Triple Falls RV Park in a Motorhome. Nothing wrong with this park. Restrooms and showers were very clean. The kids enjoyed the playground. The owner's were nice. We ended up staying an extra night. There are only 3 options for campers in the St Anthony area. If you insist on hook-ups, you can't camp at the provincial park. This RV park is superior to the other one in all regards. The other one is closer to Lanse aux Meadows. We stayed at all 3 options and liked this place best. We camped at Triple Falls RV Park in a Motorhome. This park is about 10 miles from St. Anthony. We camped there five nights and it was okay. The Internet was only available at the office and it was painfully slow. The interior roads were full of pot holes filled with water from the rain. The sites were not level. There are many, many permanent residents resulting in about 12 sites really being available for camping. There is a large camping area for caravans and those sites are held for them. While we were there a large bull moose wondered into the camp one evening. If I was in the area again, I would stay there only because it really is the only campground in the area. We camped at Triple Falls RV Park in a Fifth Wheel. We stayed here for seven nights to see the area. It's also the only RV park in the area we would fit into (MDT and large 5er). Our site was nice and long, but very unlevel. They advertise Wi-Fi so we chose a site right across from the office when we checked in only to find out that you have to be in the office to get Wi-Fi and I mean in the office. Also another boil water campground and at times there was little to no water pressure. The campground is filled with seasonal campers and they let their children roam the campground, very small children on small bikes and 12 volt small cars in the roadways totally unsupervised. Very unnerving trying to drive through the campground. Would not stay at this campground again. We camped at Triple Falls RV Park in a Fifth Wheel. This part is 95% 'seasonal' and the transient lot is a large, circular area with hookups on the periphery in separate area from the masses. We had a reservation, but it became clear that that was only 'talk' so we moved on and did not experience this 'park'. We camped at Triple Falls RV Park in a Truck Camper. This is a pretty basic park. The washrooms are clean, but dingy and old. One naked florescent tube means that once you draw the curtain you are showering pretty much in the dark. Wi-Fi reception was spotty. The hose at the dumping station used for rinsing your holding tank was broken and spayed water all over the place. Everything just seems old and run down. Unfortunately, this is the only RV park in the vicinity. The good news it is right of the main highway and close to the route to L'Anse aux Meadows. We camped at Triple Falls RV Park in a Travel Trailer. Friendly Staff. We had a fairly level spot near the office and had Wi-Fi using an external antenna on my RV. Would stay here again. We camped at Triple Falls RV Park in a Motorhome. Not many RV spots this far up so we booked a reservation. We arrived to discover our reservation had been misplaced so we were put in group camping with a group of retired US military types, great bunch! The Rv park appears to be overwhelming the owners as we noticed lots of little things could use some TLC. Lots of seasonals, odd shaped sites everywhere. Gravel interior roads but close to Lans Aux Meadows and the town of St. Anthony for the great whale and iceberg watching! We camped at Triple Falls RV Park in a Fifth Wheel. Skip St. Anthony. There are more accessible places to see icebergs and whales. Once you go into the wilderness beyond Gros Morne National Park the none-to-good Newfoundland roads have sections which are absolutely atrocious. If you must go, plan on driving 20 mph for long stretches and consuming a day to go from Gros Morne to St. Anthony. In contrast, for the same nightly rate we stayed in Rocky Harbour, NL, and had a sewer connection, strong dependable Wifi, and smooth interior roads. Are you affiliated with Triple Falls RV Park ?